A high quality direct scan and digital remaster of our original, 2-color manual, revised in 1961. 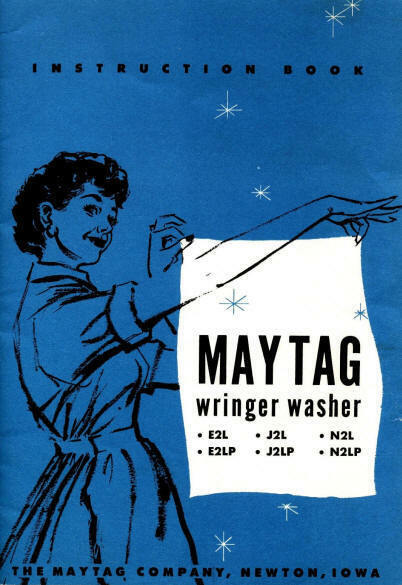 Includes instructions for operation, draining the washer, and washing specialty items in your washer. In Adobe's pdf format and very easy to download - with no shipping charges! A big advantage of pdf is the ability to zoom in on the images and examine details. Or print a hardcopy if you wish. A nice resource for both users and collectors of these great old machines! I've included a picture of the cover here so you can get an idea of the detail, although it's a much lower quality image than those in the manual itself. File size of this manual is just a bit under 7MB, so it's a quick and easy download.